I decided to bite the bullet and self-publish a set of eight short stories I've had floating around on my hard drive for years. They weren't really anything I had a home for, so I thought why not. The collection is called "Of Boardwalks and Bison" and I've published it on Kindle, nook, and my MadMumbler site (in case you want it in .pdf). Because I write fiction as Tymber Dalton exclusively for Siren-BookStrand now, I published it as Lesli Richardson. It's a little over 24k words long total. 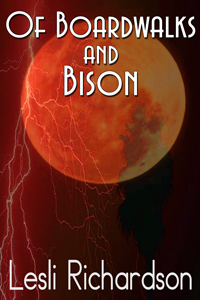 Vampires, werewolves, and bison, oh my. This collection of eight short stories from author Lesli Richardson ranges from the humorous to the horrific—sometimes in the same story. From a vampire just trying to find a little peace and quiet in a retirement community, to a woman letting a bison take the fall for her husband taking a swim, traverse a landscape of revenge, justice…and horny flounder demons with inept alcolytes. So...today's question is, what are you currently reading? I'm working my way through "Fear Itself," which is a non-fiction book about Stephen King and his work. Hi - I can hardly wait to go buy your latest books and right now I am reading Cowboy Boots and Untamed Hearts by Natalie Acres. Just started and was on page 5 when I started checking this out. Love all of your books !! I just started reading Laurann Dohner's New Species series. First one is called Fury. Prior to that I was working my way through Shayla Black's Wicked Series. I've found that the reading stand on my treadmill is the perfect place for my Kindle. So I manage to get 30-60 minutes of reading in each night. I love getting new stories from you! I am currently reading The Rancher and the Rock Star by Lizbeth Selvig who is a new author to me. I am enjoying it so far. I have not been reading as much lately but it is something I love to do! I just started reading Lewis's Dream (Brac Pack 10) by Lynn Hagen. Only 15 more to go to finish the series. I am currently taking a break from my usual erotica and reading the Fifty Shades Trilogy. I found it funny how many people Lund the first book so scandalous. I told one person that if they thought those books were steamy they need to read some of the books you write. I'm in the middle of Brimstone Blues. I'm not sure why it's taking me so long to finish it. I usually gobble books up, maybe I'm finally learning to savor them. Lol. After that it's rereading Seduce the Darkness by Gena Showalter part of her Alien Huntress series. Then more rereads until JR Ward's Lover Reborn comes out. I think JR Ward and the Tymber Dalton books are the only ones I've cried hysterically over bcuz of the characters and situations. *cough cough Reluctant Dom* I <3 books. Today, I started "Sunset Hearts". I usually like to stay on the same author for a few books and then switched. After this one, I'll go for a lighter read with Maya Bank's "Tempted by Her Innocent Kiss". I'm currently reading Night Games by Crystal Jordan, then Curses! A F***ed Up Fairytale. I'm really excited about Laurann Dohner's new book, but I need to get my review books done, because I'm supposed to be doing a reread of BDB with my girlfriends before the next one comes out later this month. Too many books, not enough time! I just finished reading ALTERED HEART by Kate Steele. My daughter wants he to read THE HUNGER GAMES before the movie comes out. I don't know though. I kind of want to stick to the adult stuff I've been reading. I guess I'll see what I can find.